The measure of any great art is if it makes an impact on you. Does it move you? Does it make you think? Do you walk away from the piece and think about it again? Well it's been about a week and a half since we saw Ben Harle's artwork at the Nelson-Atkins Museum in Kansas City and I am still thinking about it! 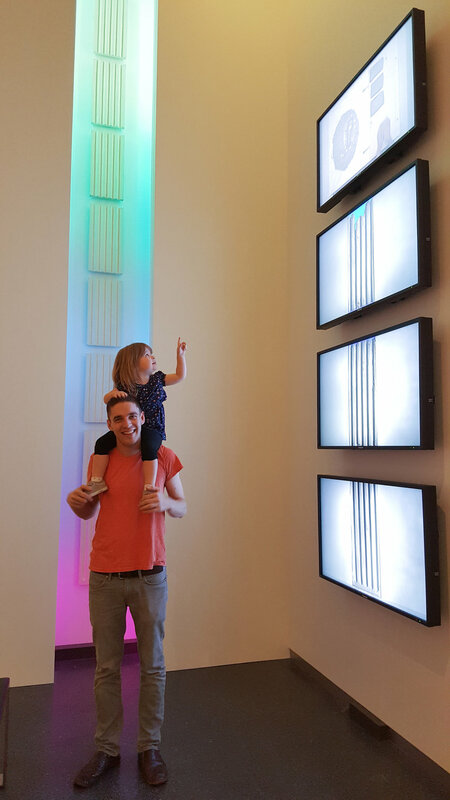 The installation piece entitled "Moments of Impact" definitely had an effect on me but especially made a lasting impression on my three year old daughter. Before I give my thoughts and experience about our visit I must say if you are in or near Kansas City this weekend GET TO THE NELSON-ATKINS MUSEUM! It's a FREE Museum! 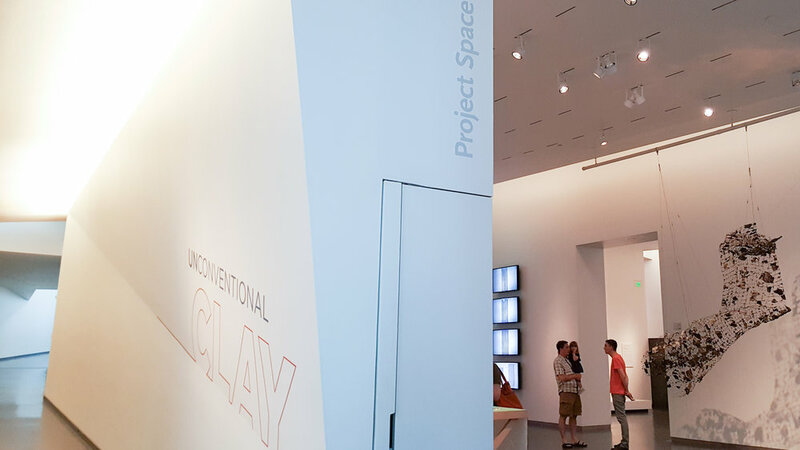 Seriously get there and see this group art exhibit, Unconventional Clay before it's too late. The show closes June 12th. If you plan to see it hop over to the Nelson-Atkins Museum website for more details and then come back and read the rest of this later. I don't want to spoil the surprise. I love to take in art unfiltered with no expectations. So if you are planning on seeing this amazing artwork pause here. If you have seen it or sadly it has already left then please read on for my thoughts and experience. I first met Ben Harle when he was only 15 years old. I had just begun dating his older brother, Jon, who is now my husband. I have been so lucky to watch Ben and his artwork grow. It is truly amazing how far he has come. Ben was talented even back in high school but his latest piece is so smart and creative on so many levels I can not stop thinking about it. When we first heard that Ben was going to have a piece at the Nelson-Atkins Museum in Kansas City we knew we had to find some way to attend. It wasn't easy and our trip was much shorter than I had originally wanted. However I am so happy that we got to see and experience his "Moments of Impact" installation. Being a photographer and having gone to art school I understood it is a high honor to exhibit at a museum such as Nelson-Atkins. There are so many artists that will never have a piece in a museum of this level, however after seeing Ben Harle's work I know this will not be the last time his work will be seen in the halls of great museums. 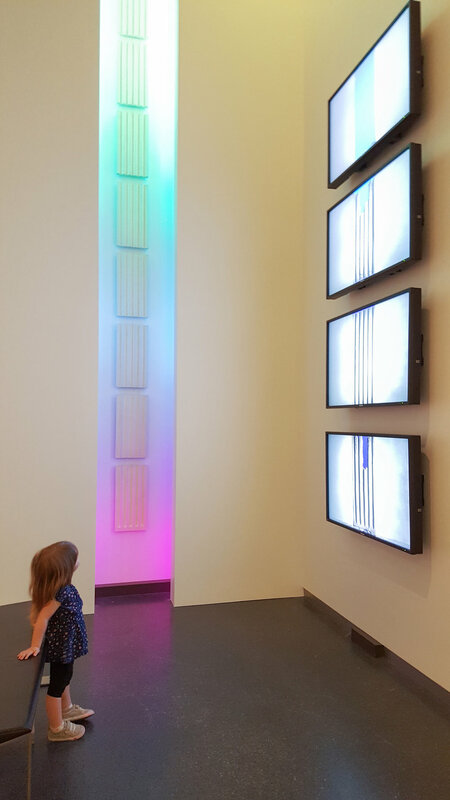 When we first walked in the four video screens and the colorful lights highlighting the ceramic column drew us in to that peaceful corner of the Unconventional Clay exhibit. As we arrived there was a couple in front of Ben's piece debating what it meant to them. It was so interesting to hear others discussing his work. We chatted at a distance from them for a couple minutes. Ben gave us a few of his thoughts on the piece and we took it all in for the first time. The gentlemen heard us and said excitedly "Are you related to the artist?!" I wanted to scream "YES! He's my brother-in-law Ben, I am so proud! And he's standing right here!" Luckily though I was rendered speechless. Jon spoke up and calmly in a less embarrassing way said "he's right here." I felt like we were with a celebrity because well we kind of were. Being able to view artwork with the artist is a very special experience. Ben talked with the gentlemen and discussed a little bit about his intentions. Ben Harle's artist statement (below) and his video about his process can explain it much better than I could put into words. "I believe our lives are shaped by specific moments of impact. Instances that alter our perspective of the world can occur in one second of time. I’m interested in translating these moments to the gallery or museum through installation and video. Properly fired ceramic will last forever. The object may shatter but the material is nearly impossible to decompose. Leaving clay unfired allows water to naturally weaken and eventually deconstruct the form. It is nearly impossible to predict exactly when the clay forms will collapse. In the same sense, it is impossible to know when specific moments of impact will change our lives forever. My studio practice is an extended attempt to uncover my own relationship to these moments of unpredictability." One thing I love about art is that it is subjective, there is no right or wrong experience or feeling about it. As I said I have watched Ben Harle's artwork and thoughts mature and grow from seemingly simple ceramic pots in high school to complex and thought provoking installations. I love this latest piece for so many reasons, some I might not be able to express in words, but here is my attempt to describe my experience with the artwork. The four video screens show different parts of the ceramic making process. This was so fascinating to watch! We love seeing how things work. It was exciting to see what would happen next and just how and when the clay pieces would crack and fall. I love how engaged she is with the art. Even in her body language you can see her taking it all in. For a couple days after we left the museum she talked about the process and would go on and on about it. "The water came out of the teeny tiny holes" she would say describing one of the stages of the piece where the broken pieces of the clay lay in a sink with water that slowly filled the sink and the clay got wet and lost its shape. She also took so long going to bed that night because she kept asking "what happened next?" as we recounted over and over all the steps in the process of making and also destroying the clay pieces. I think we could have watched the video all day but we decided it was time to step away from it after we had watched most of the hour and twenty minute loop and when a security guard came over and told us we couldn't have a toddler on Ben's shoulders. Well at least we got some adorable pictures first. She could not take her eyes off of the artwork. She just wanted to see what happened next and learn all about the process. I did not take many photos. In fact I took only one or two on my big camera, all the photos I quickly snapped were on my cell phone. I wanted to document the art because I am a photographer. But more importantly I wanted to experience the art and take it all in. I was pleasantly amazed at how drawn to the art our daughter was. My heart was so full that day in many ways. I was so proud to be standing in that wonderful museum and seeing the label with Ben Harle's name on it while staring at his thought provoking piece. I was also moved watching my daughter experience an art museum and artwork up close for the first time. How special this was that her first art museum experience was to see her uncle's artwork. Seeing how much of an impression it made on her was even more moving. Listening to Ben talk to viewers of his work including us, sharing moments with his brother and interacting with his niece all while standing in front of something beautiful he created made me so happy I wanted to cry. Loved seeing Ben's name on the wall. In the days since viewing "Moments of Impact" I have been moved to tears thinking about every part of the piece and different meanings of it. There are so many layers and can mean so many different things to each person personally. Like any great work the interpretation can change at different times too. The more I think about it the more I see within it. I am not an art critic and while I have a Bachelor in Fine Arts degree in Photography I do not claim to be any kind of art expert. So the ideas expressed here are my personal opinions and experience with the work. I encourage everyone if they have a chance in next few days see it in person to form your own ideas and check out Ben Harle's website and social media feeds in the future. 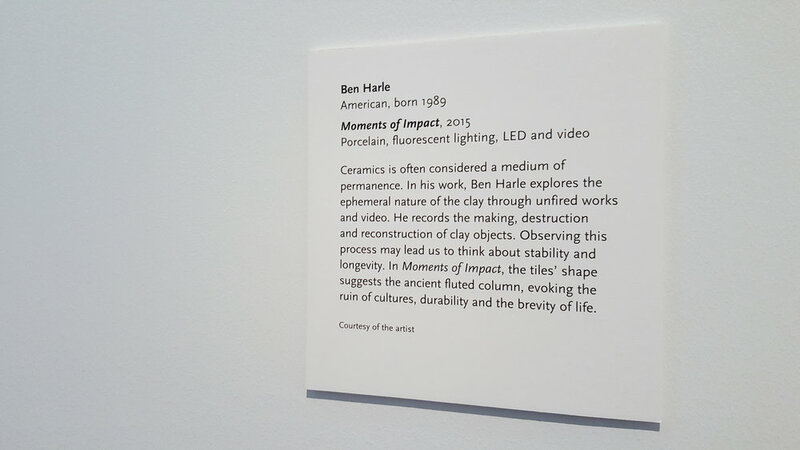 When viewing the ceramic installation "Moments of Impact" by Ben Harle I thought about all that is fragile and ever changing in life. His piece could be a metaphor for everything about life and relationships. As a mom I thought about how a baby and child grows and changes. Children move through different stages of life and how they interact with the world changes, often quite rapidly. About a month or two ago my three-year-old was having a really tough time with everything. Being three is really hard, so many changes going from the baby/toddler stage where everything is done for you to a more grown up kid doing so much on your own. I can not image the emotions that comes with this struggle. One day we talked about it and she broke down and told me through tears "I don't want anything to change!" Those words cut deep. I felt her pain. I knew just what she meant, sometimes you just don't want things to change, you want children to stay little, hold them a little longer, and freeze time. One of the things I love about photography is the ability to freeze just a tiny fraction of time, to hold it in your hands and to remember it. However all things change. Sometimes the changes happens slowly like the slow dripping water on Ben's clay pieces that changes the form slowly. Sometimes change happens so rapidly like a crack that forms and then breaks and falls with a crash. As Ben said you don't know when it's going to happen, you don't know if it will be fast or slow but you know an inevitable change will happen. Almost nothing in life stays the same forever. Like his clay when children, relationships or life changes something new or different is created. Sometimes, in fact often, changes are for the better. It can be sad to let go, sad to move on, but we grow and with each new part of life there is different wonderful creation. Some changes leave a lasting impact on us, like his fired ceramic pieces, changing our lives in a way that can not be forgotten. We do not know what moments big or small will impact and change our lives and that is the scary yet beautiful part of life. As a parent these thoughts of unpredictability are even more scary because we are responsible for another life. We help mold and shape our children, as do all the people in their life, and we can not predict what moments will impact them or change them. All we can do is be there to pick up the pieces when they--or anyone in our lives--breaks (for better or worse), when they go through changes, and hold them or help them pick up the pieces as they begin the next stage of life or different form of themselves. There have been so many big and small "moments of impact" in my life that I could have related to with the artwork but none has made a more lasting impact than becoming a mother. Like the fired ceramic being a mother and the love for my child is permanent and lasts forever. I tell my daughter often that "everything in life changes but the one thing that will never change is my love for you." Thank you Ben for welcoming us to Kansas City, for showing us some wonderful places and for sharing your artwork with us. Your work made an impression on all of us. We look forward to seeing what you come up with next. Playing with the Aerobie in a park next the Plaza in Kansas City on a beautiful spring day.